In this Monday, May 28, 2018, file photo, President Donald Trump shakes hands with Secretary of Defense Jim Mattis during a Memorial Day ceremony at Arlington National Cemetery in Arlington, Va.
Officials say Defense Secretary James Mattis has been caught off guard by President Donald Trump's decisions on things like the United States' withdrawal from the Iran nuclear deal and a pause in U.S. military exercises with South Korea, NBC News reported. Officials say the president has been relying less and less on Mattis' advice — a stark contrast from his early enthusiasm for the retired four-star Marine general and one of his earliest Cabinet members. 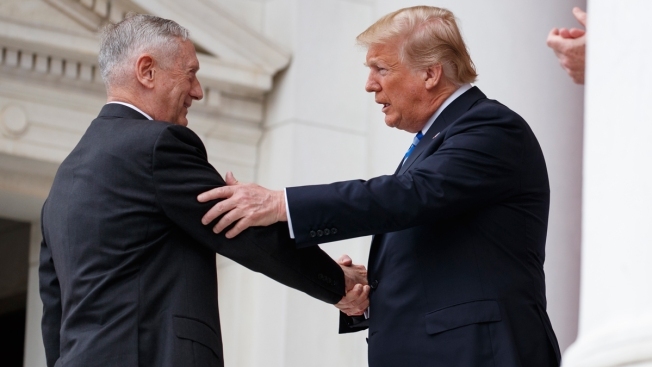 Former and current administration officials say that their relationship has cooled because Trump believes Mattis looks down on him and slow walks his policy directives. "They don't really see eye to eye," said a former senior White House official who has closely observed the relationship.